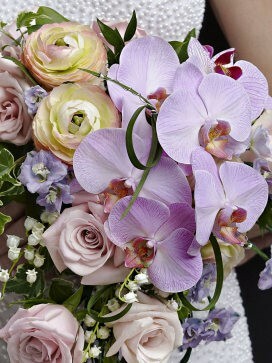 This luxurious, lavish and classically romantic bridal bouquet is one fairytale dreams are made of! Feast your eyes on this sumptuous selection of traditional and exotic textures and shapes, mixed with a multitude of lavender, purple and ivory tones, combined with the creative use of lush, vibrant greens. 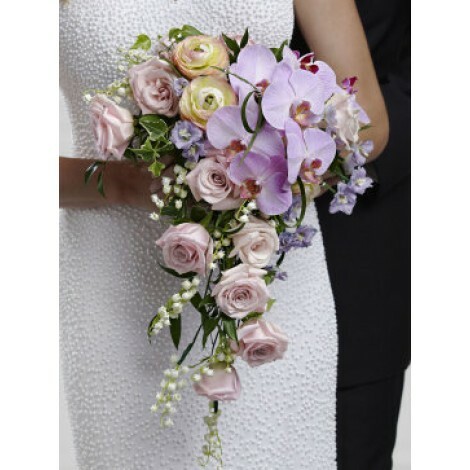 This adorable, romantic bridal bouquet is set to pristine perfection in a unique tear-drop, cascading style. Approximate dimensions; 17"H x 23"W.